How often does one get to see prehistoric animals on a blanket that keeps a child not only warm, but happy at the same time? The Heritage Dino Patchwork Quilt Set has been given the thumbs up as it keeps kids and parents alike happy with bright, primary colors and an attractive, friendly theme. The quilt set is hand-crafted from 100% high quality cotton which means the entire set launders well, and according to one parent, she was pleasantly surprised at the overall sturdiness of the set. You can machine was the set on a gentle cycle and tumble dry on low heat. 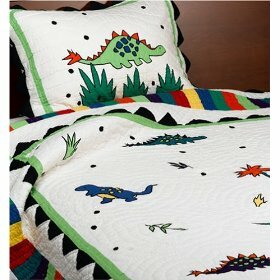 And unlike those times when you look at the colors in a the picture and when you receive the item the colors are either darker or lighter than those shown, Well this is not the case with the Heritage Collection Dino Quilt Set, reviews say that what you see is what you get and the colors are actually right on the money from the pictures that are displayed. The quilt has soft, thick cotton batting and measures 68 inches x 86 inches and the matching pillow sham measures 24-by-30-inches. Several reviewers said not only did their children love the set, but that they were checking out the Heritage line for additional quilts. The dinosaur designs are described as ‘cute’ and on reviewer raved she would definitely recommend it to other parents looking for dinosaur themed bedding.